Last month, HPWREN researchers wrote and implemented software that utilizes SIO's Institute of Geophysics and Planetary Physics (IGPP) existing seismic sensor network to distribute real-time data to client computers. Coined Multi-cast Quake, or Mquake, the software provides date, time, location, magnitude, and additional details regarding seismic activity that occurs within the 15-station ANZA Network. 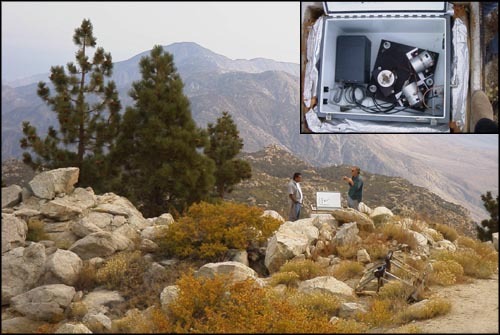 Straddling the San Jacinto fault zone from the Buck Ridge fault in the south to the Hot Springs fault at the north end, sensors consist of Streckeisen STS-2 seismometers with Reftek 24-bit broadband digitizers linked to the central multiplexing and relay site on Toro Peak in the Santa Rose mountains. These sensors will soon be connected to HPWREN - in lieu of their current point-to-point wireless network. Mquake makes mult-cast real-time distribution possible for parametric information from individual sensors, as well as summary data - providing analyzed results after the determination of location and magnitude of seismic activity. The data is being transferred to many machines simultaneously via the IP multi-cast overlay called MBONE; however, with less network efficieny, the data can also be transferred into a non-multicast environment. The objective is to provide notification prior to actual shockwave arrival at the client machine, as well as analyzed information within a minute or so following an event. "The ability to stream real-time seismic data straight from sensors to worldwide computers via MBONE is interesting," said HPWREN co-PI Frank Vernon. "We have used a variety of methods for distributing data over the years, however, multi-cast capabilities present potential novel methods for the rapid dissemination of essential information." "In the middle of the night on October 30, my wife and I awoke to a noise that was unmistakably indicative of an earthquake. Because this was the first earthquake we felt in the adobe house we moved into about 18 months ago, and also given other recent events, we walked out of the house to be in a slightly more favorable location. Turned out it was an approximately magnitude 5 quake in the Santa Rosa Mountains area, according to various reports between about 67 and 71 kilometers away from my house. Not too far from where SIO seismologist Frank Vernon had pointed out to me a few weeks earlier on a field trip that I was right on a major earthquake fault line. Based on software written by Frank Vernon and Todd Hansen, my always-on computer at home continuously receives data from SIO earthquake sensors, as well as summary messages once the location and magnitude has been determined. These messages are sent instantaneously via UDP/IP, and can be send via multicast to a virtually unlimited number of computers simultaneously. Just a few days before this event, the Santa Rosa Indian Tribal Council, in who's area the event occurred, had expressed interest in earthquake data to be studied by their youth! While for seismologists like Frank it is imperative to know when and where and event happens, including details like amplitude and depth, what matters for me is when the shockwave hits my location, as determined by the sensors. Let's do some approximations here. The event travels at about 5 kilometers a second through the ground. At an about 70 kilometer distance, it would have brought "T minus zero," the time I care about, to be 14 seconds after the actual quake to happen. I.e., T-14 was when the earthquake happened that I felt about 70 kilometers away. T-14 was at 23:56 and 15 seconds Pacific Standard Time. The first sensor notified that there was "an event" (no magnitude or location) about 3 seconds into it (takes a while to get there), and reported it to my computer about 7 seconds later, at about T-4. The fourth sensor report, enough for a quick location approximation, arrived at about T-1.4. In other words, four seconds before the shockwave hit, my computer knew there was something major coming. Often enough time for me to get into an at least slightly more favorable situation, or someone doing a critical operation to hold off and pause. Slightly more than a mere minute after the arrival, at T+71 or 85 seconds after the actual event, my home computer received notification about latitude, longitude, and magnitude and depth of the event from the central analysis machine at SIO. Which helped, given recent events, to conclude "uh, it was really just an earthquake." Additional information regarding HPWREN and geophysics applications is available at http://hpwren.ucsd.edu/news/020905.html and http://hpwren.ucsd.edu/news/010124.html.